It was one of the colder mornings in late December. 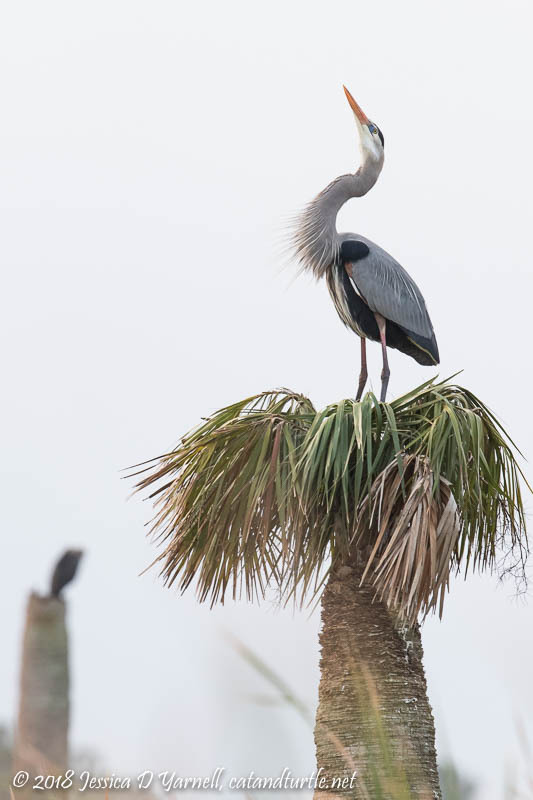 As Floridians don heavy coats, hats, and gloves, our avian friends in the wetlands already think it’s springtime. 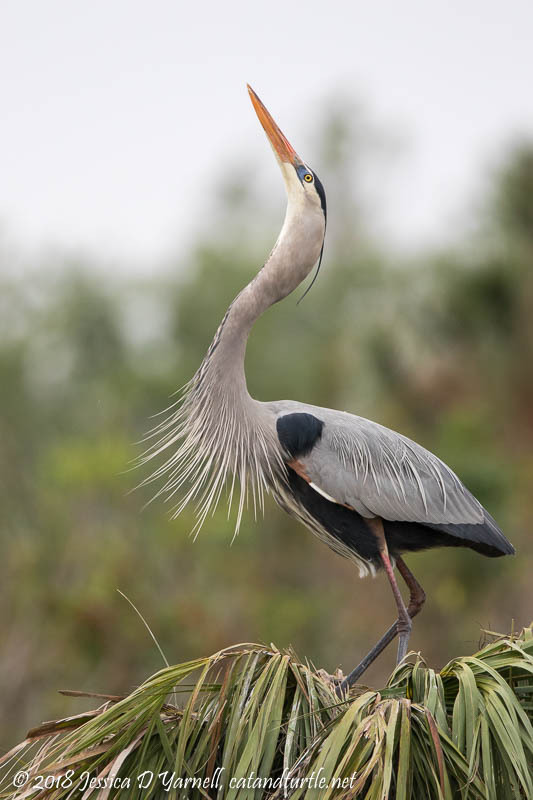 Great Blue Heron nesting season is definitely underway at Viera Wetlands! It was another super-cloudy day (seems like that’s the norm for all my winter breaks). But the bird activity was great. Viera Wetlands Fog-Rise. I think the weathermen were a little optimistic with their “part sun” forecast. At first I was happy for the clouds. There was a tiny glimmer of color in the east, and the lack of bright sun meant that I could point my camera towards any nest that I wanted. A pair of herons was nesting-building in the center of the wetlands, in the trees pictured above. I noticed one of them fly away, pick up a stick, and prepare to bring it back to the nest. Isn’t it great when they give you a three-second warning before the good action starts? I pre-focused on the bird in the nest and captured the hand-off as the stick was delivered to the nursery. Great Blue Heron Nest-Building. HDR applied to bring out the color in the sky. 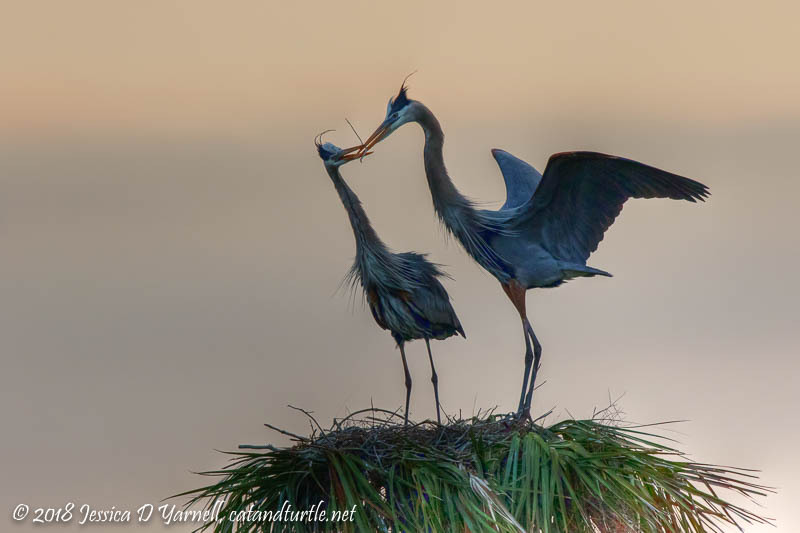 It never ceases to amaze me how gentle the Great Blue Herons are as they build their nests. Their long legs and wings are graceful and every stick is laid with such precision, often with both birds holding onto the stick to help guide it into just the right place. 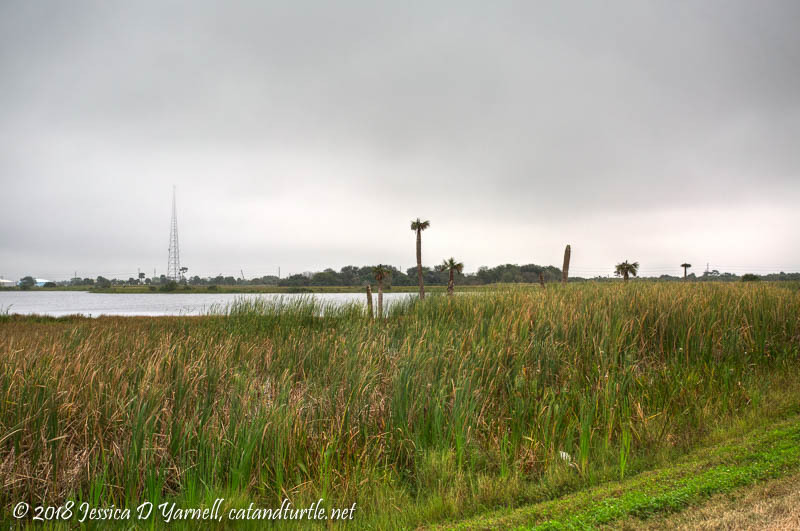 There are a bunch of palm trees in the wetlands that the birds use for nesting. Some, like the tree above, still have green palm fronts on top. Others are just the dead stump. On this particular morning, almost every tree had a bird on top of it. 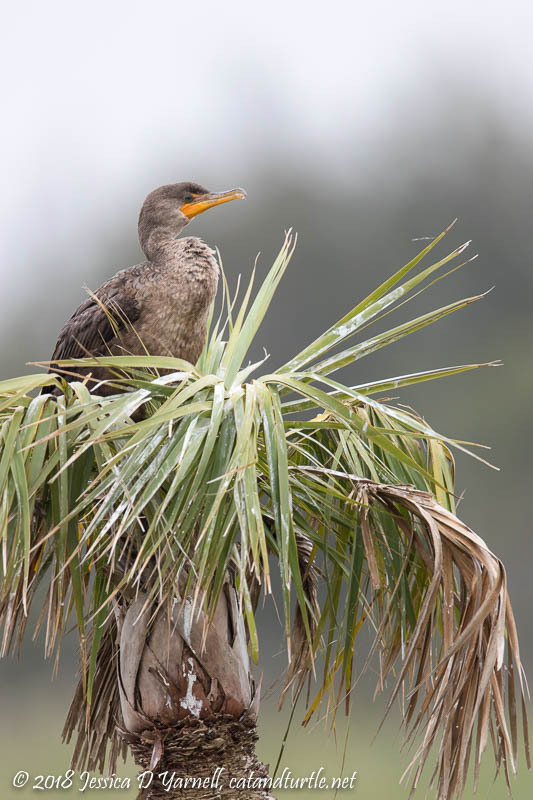 Herons, cormorants, and anhingas were all staking their claim to nest real estate. This particular Great Blue Heron turned out to be my most photographed of the morning. 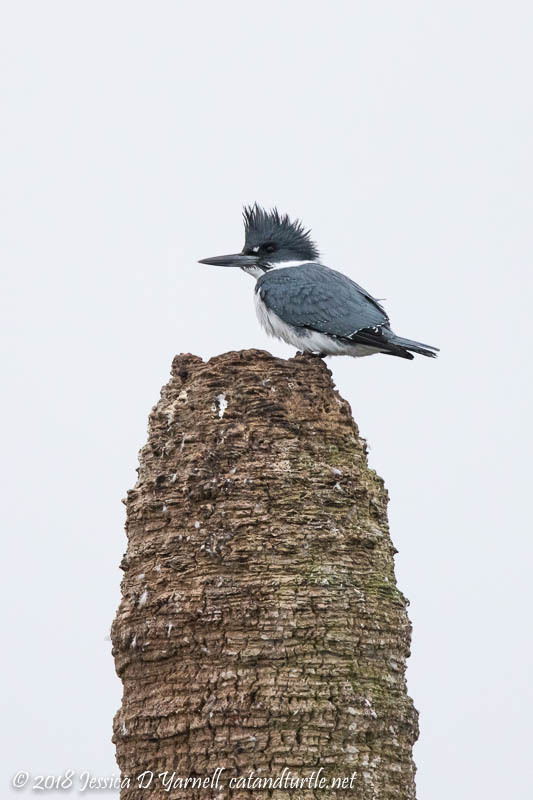 He had staked out his nest tree and was engaged in repeatedly performing a stretch display to get the attention of a female. His breeding plumage was beautiful – note the long lacy plumes on his neck and back and his bright blue lores. He would throw his head back to the heavens, stretching his long neck. It’s a fun behavior to photograph and he did it over…and over…and over! Poor guy. I didn’t notice the females showing him any interest. The Anhingas are also in their bright breeding colors right now. 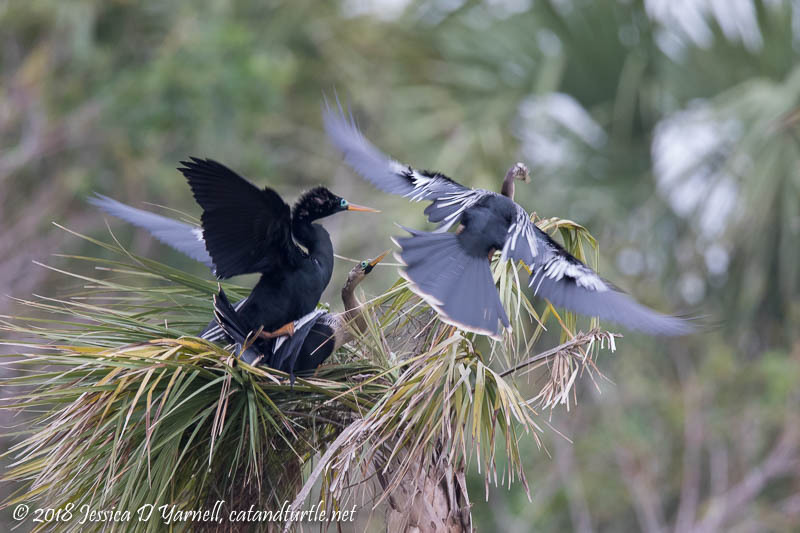 Normally Anhingas are overlooked as one of the more common birds in the wetlands. But I can’t resist stopping to admire them when they are sporting those bright blue eye rings. Not all birds were nesting. This Belted Kingfisher used the top of his palm tree as a vantage point to watch for fish in the water below. When he spotted a fish, he’d dive down to grab it. 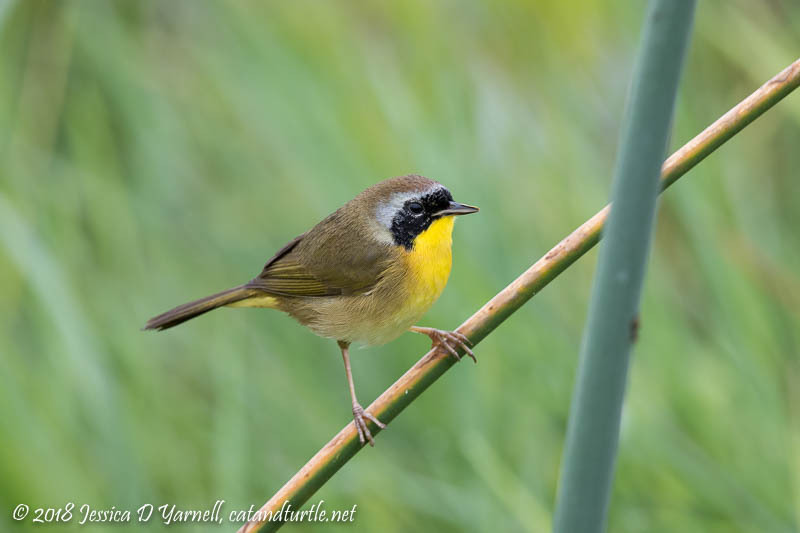 I heard the call of a Common Yellowthroat and looked down to see one just in front of my camera. Perfect pose! This is the bird that my dad and I call “Zorro” because he wears a black mask. 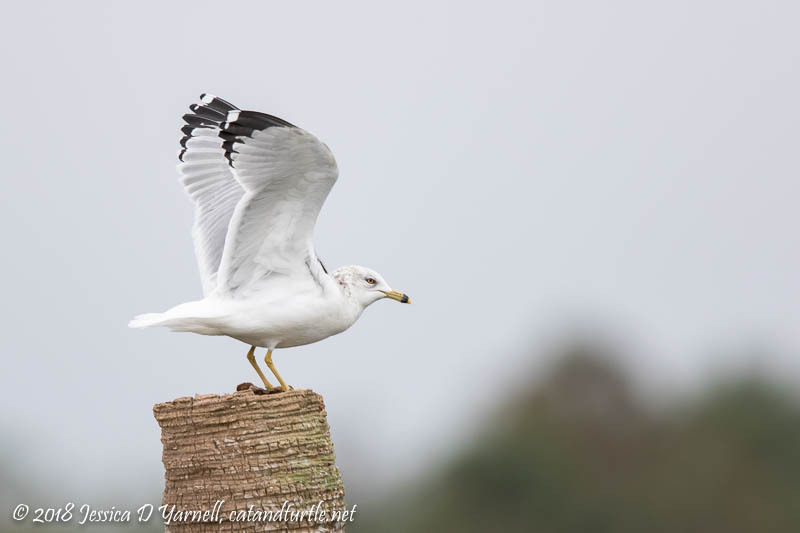 A Ring-billed Gull was circling over the wetlands. Periodically he’d land on a palm, rest for a few seconds, then fly off again. I noticed more Double-crested Cormorants than usual at Viera. Some of them were sitting in the palms, as if they were considering nesting there. You can see from the white splotches of poop on the fronds that these birds have spent a lot of time in the trees. Maybe we’ll get to watch baby cormorants growing up there this spring. I had to laugh as I was capturing this next photo. 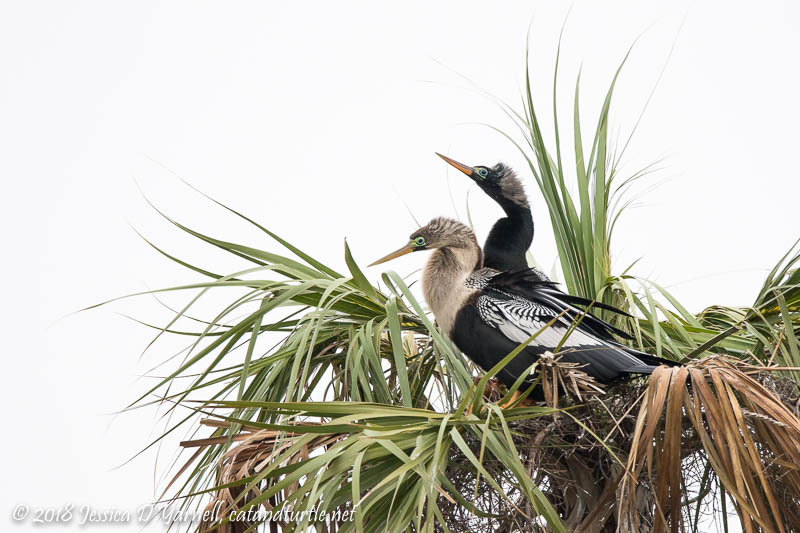 A pair of Anhingas had definitely bonded and made their final nesting site selection. They had spent all morning in their tree, adding a few branches and displaying together. But another male seemed to be competing for the interest of this female. Just as the mated pair began to mate, the other male made a last effort to show win her affection. He did not succeed…but there was a great deal of wing-fluttering involved! 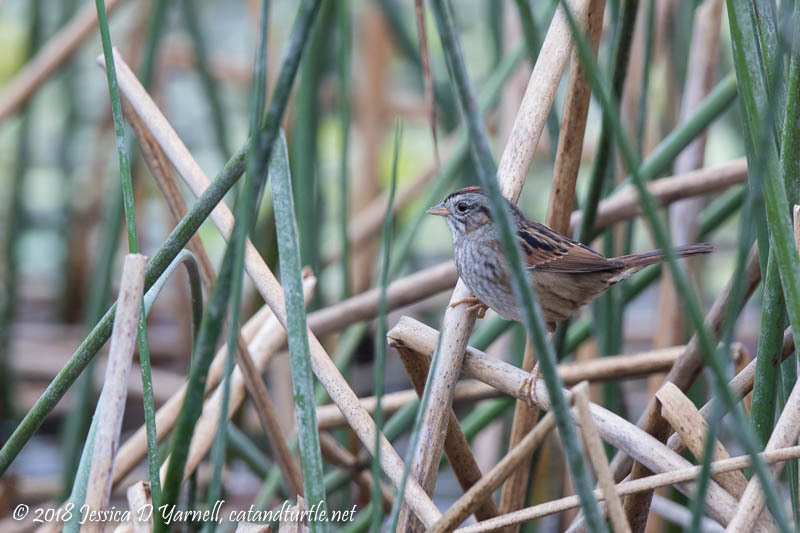 My last bird of the morning was this small Swamp Sparrow in the reeds. He said goodbye to me as I pulled out of the wetlands, and encouraged me to come back on a nice sunny day. I think I’ll take him up on that offer!